A large British Napoleonic Dragoon Trooper's Sword. This sword has a brass stirrup hilt with a grip composed of fishskin and brass twistwire - all of the original fishskin is still present. The blade is straight and substantial and the length probably indicates use by a heavy cavalry trooper. The blade is plain and double-edged towards the point. 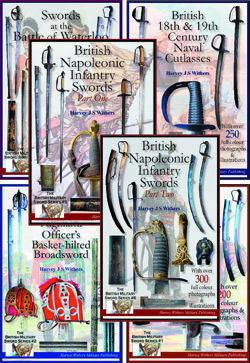 This is not an official regulation pattern although the hilt is based on the 1796 Pattern Light Cavalry Trooper's Sword. It could even be pre-1796 and one of the many differing types that were used by cavalry regiments before standardisation came into force. Condition of the sword is good overall - some losses to the metal on the blade. Both the hilt and the blade are rock solid and have never been removed and re-seated. Blade length is 32 inches (37 inches overall).